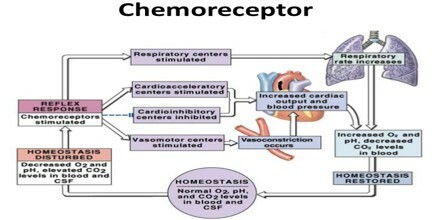 Chemoreceptor is a sensory nerve cell or sense organ, as of smell or taste that responds to chemical stimuli. 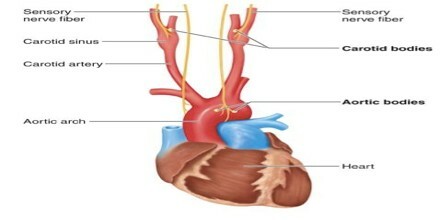 It is usually refers to those which influence the respiratory and cardiovascular control centres in the brain stem: the medullary chemoreceptors, sensitive to pH changes in the cerebral extracellular fluid, and the arterial chemoreceptors which continually sense and respond to changes mainly in blood oxygen, carbon dioxide and pH, leading to appropriate reflex adjustments via afferent nerves to the brain stem control centres. Chemoreception relies on chemicals that act as signals to regulate cell function, without the chemical necessarily being taken into the cell for metabolic purposes. While many chemicals, such as hormones and neurotransmitters, occur within organisms and serve to regulate specific physiological activities, chemicals in the external environment are also perceived by and elicit responses from whole organisms. In more general terms, a chemosensor detects toxic or hazardous chemicals in the internal or external environment of the human body (e.x. chemotherapy) and transmits that information to the central nervous system, and rarely the peripheral nervous system, in order to expel the biologically active toxins from the blood, and prevent further consumption of alcohol and/or other acutely toxic recreational intoxicants. The cells in our bodies that are specifically designed for sensing have receptors on their membranes, the outside boundary of the cell. These receptors act like little fingers that grab things around them and then in turn tell our brain what they found; even if it is sensing a smell we would rather not smell. Central Chemoreceptors: These are located on the ventrolateral surface of medulla oblongata and detect changes in the pH of spinal fluid. They can be desensitized over time from chronic hypoxia (oxygen deficiency) and increased carbon dioxide. 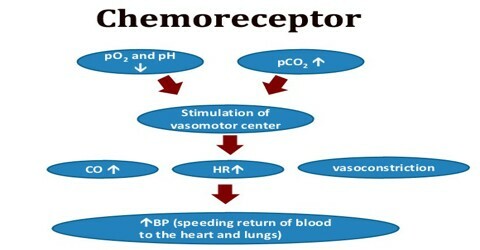 Peripheral Chemoreceptors: These include the aortic body, which detects changes in blood oxygen and carbon dioxide, but not pH, and the carotid body which detects all three. They do not desensitize, and have less of an impact on the respiratory rate compared to the central chemoreceptors. Central Chemoreceptors are located on the ventrolateral surface of medulla oblongata and detect changes in pH of cerebrospinal fluid. They have also been shown experimentally to respond to hypercapnic hypoxia (elevated CO2, decreased O2), and eventually desensitize. These are sensitive to pH and CO2. 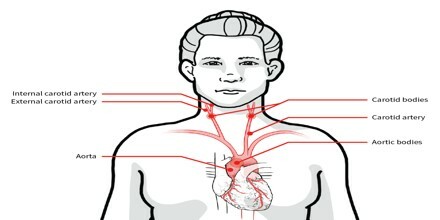 Chemoreceptors are also found in our hearts and heads. If we have ever felt ‘short of breath’ because of exercise or nervousness, the chemoreceptors in our body have detected that oxygen levels are too low or that carbon dioxide levels are too high.